Six wins, 10 second places, 16 podiums and only one retirement. 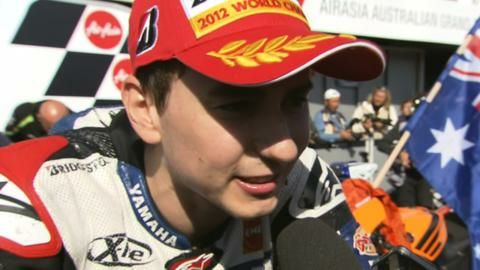 Jorge Lorenzo is MotoGP champion again and thoroughly deserves it. He was second in Australia as Casey Stoner won, but, crucially, Dani Pedrosa failed to finish, which meant Lorenzo is the king again. It's been a ridiculous season from Jorge. His worst finish has been second all year, which is incredibly consistent. We said at the start of the year that this title was likely to be won by the person who didn't crash. He did once but it wasn't his fault - he was taken out at Assen by Alvaro Bautista - but other than that he has been in the top two of every race. To go along and collect 25 points, 20 points, another 25 points, makes it so hard for anyone else to beat him. I would think that he can win a few more championships yet. He was helped this season by Pedrosa crashing out a few times and Stoner missing some races through injury, but that is what motorcycle racing is all about. Crashes can injure you more than in any other form of motorsport. It is a hazard that is always there, and staying fit and healthy is just as important as staying fast. I expected Pedrosa to win the race on Sunday or crash, and that's exactly what he did. I thought he would beat Lorenzo this weekend to take the title race to the last race at Valencia, but to beat Lorenzo you have to ride on the limit - and he made a mistake. He ran a metre wide going into a corner. It is dusty and dirty off the racing line, his tyres weren't up to full temperature on lap two and he crashed out. It is a fine line that they walk, and on Sunday it snapped. That finished our year off. Dani did all he could do but it didn't work out. He was pragmatic enough after the race as he knew he had to go for it. No-one was going to catch Stoner - he was in a class of his own. Cal Crutchlow said before the race that we needed a different class just for Casey this weekend and that was about right. Stoner is not Valentino Rossi. He's a shy and retiring guy who doesn't really want to get involved with the public but they came out in force to see him and he came up with the goods. You could see how much this one meant to him. It was the biggest crowd we've had in Australia in years. There was a track invasion at the end as everybody tried to get a piece of Stoner. He has won in Phillip Island for six years in a row, and in that time he has led for 160 of 162 laps. Remarkable. Finally, get ready for Marc Marquez. The 19-year-old wrapped up the Moto2 title in Australia and he will take Stoner's spot at Repsol Honda in MotoGP next year. This young lad is going to be very, very quick and could shake things up a bit. So there's one more race to go, in Valencia on 11 November. Make sure you join us for that one.